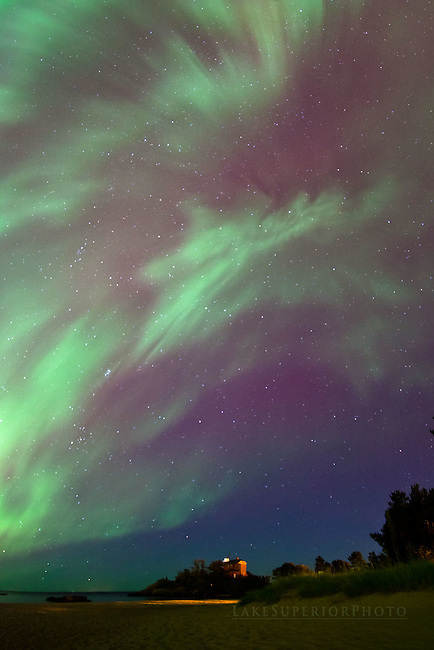 The aurora borealis northern lights dance across the entire sky during a strong solar storm event at the equinox. The Marquette Lighthouse and Maritime Museum is dwarfed by this incredible image of the amazing light show. A photo picture image of the aurora borealis northern lights corona over the Marquette Lighthoues in the Upper Peninsula of Michigan on the shores of Lake Superior.